The South African war is over. And now a grateful people will willingly turn aside from the Krugers and their ilk, the Boers and Free Staters, and embrace us as their friendly conquerors. For we will not place them in chains; no, on the contrary. Once they prove loyal and trustworthy, the settlers will see their homes repaired, their lands restored. The news came into Penzance from London, yesterday evening – the end of a sleepy Sunday afternoon. When the telegram arrived at the Post Office, the operator said it was better than being handed a five pound note. The news was bound for the Telegraph offices in Chapel Street, and was posted up outside. Of course, Sunday being Sunday, the official jollifications have been held today. Once the services were over last night there were a few youngsters about, singing “Rule Britannia” and “Soldiers of the Queen”, then following that with “Dolly Grey” and the like. Truth to tell, it doesn’t sound quite dignified. But once midnight struck , of course Sunday was over and word had got about that the Volunteer buglers were on their way. There was a big crowd, never mind that dawn would soon be coming up on Monday morning, and another working week. And the buglers never did show themselves, but the people were in no mood to go home and were soon making their own music. In all honesty, there was more variety than skill in the accompanying instrumentalists: “fog-horns, penny trumpets, horns, tin cans, whistles…” someone even brought out their tin bath and banged away on that. And then folk from Newlyn came along and joined in, and the jollifications went on until three. Only time for a bit of a snooze before the 21-gun salutes started a couple of hours later. So – shall we take stock this morning, in the light of day? The Victorian age is over, and a Coronation on the way. The 19th century is over. The war is over, and a century of peace, prosperity and progress surely lies ahead. 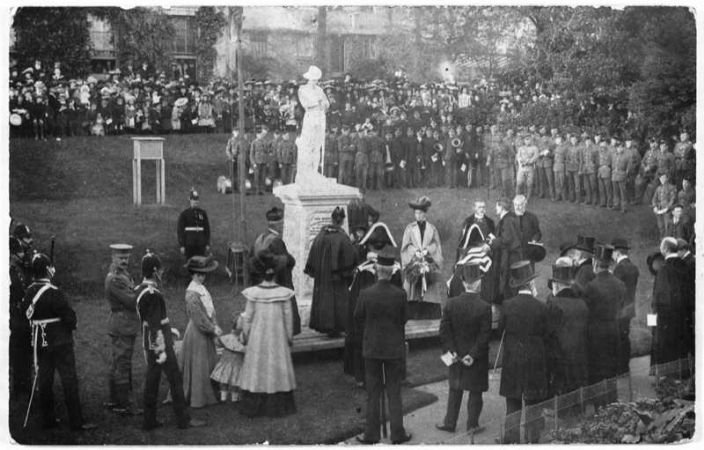 Picture Credit: Vaughn Paul, “Dedication Boer War Memorial , Morrab Gardens , Penzance,” Morrab Library Photographic Archive, accessed May 15, 2017, http://photoarchive.morrablibrary.org.uk/items/show/3696.